With the 20-kilometer-long coastal line, only 3 hours driving from Ho Chi Minh, Vung Tau is one of the most favorite tourist destinations of both internal and external tourists when going on a trip to Vietnam package. From this place, you can watch the charming beauty of the Eastern Sea, preferably in the dawn or twilight. 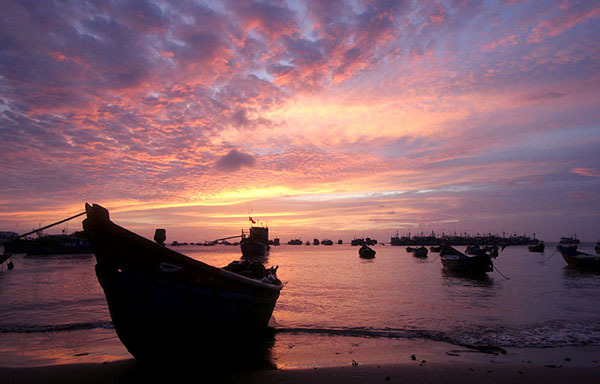 Besides the values of natural landscape, Vung Tau is also the land of long-time historical and cultural tradition. Coming to visit Vung Tau, you will feel the peace and comfort of the atmosphere with broad and airy streets. Not only being famous for the beach, Vung Tau is also known for its attraction of mountains and solemn pagodas. 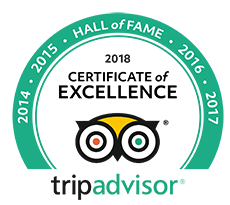 This article will give you a general introduction to this tourist place with the most outstanding features and famous sceneries. Ba Ria – Vung Tau Province location belongs to the tropical monsoon climate with two separate seasons in a year. The rainy season is from May to October, the time under the influence of the Southwest monsoon. The dry season is from November to the next April with the influence of the Northeast monsoon. The average temperature annually is around 27 Celsius degree. You can visit Vung Tau any time in a year actually because the weather is never too hot or too cold. All you have to do is watch the weather forecast beforehand to avoid harsh rains or storms. 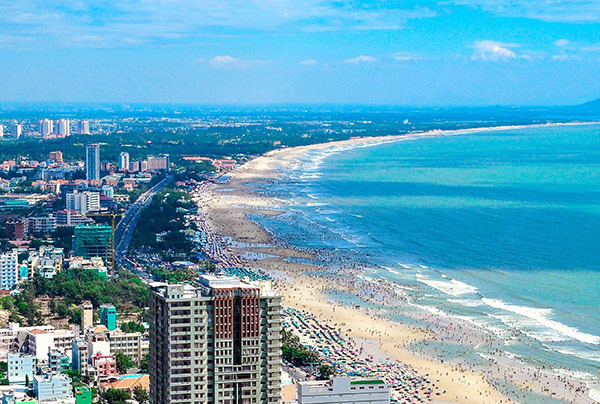 Besides, on the weekend or on holidays, Vung Tau attracts a lot of tourists. 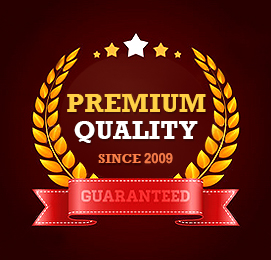 As the result, the service costs also rise quickly. The Back Beach in Vung Tau is famous for its beautiful coastal line. Its waves are not big and around the beach, there are many hotels and eating areas. Therefore, many tourists love to visit the Back Beach when coming to Vung Tau. Besides, Thuy Van bending road is quite famous in this area, with tremendous hotels gathering along it. The Vung Tau city center is located on the Front Beach, which gathers many buildings and noisy markets or commercial malls. Tourists often prefer swimming in the Back Beach because it is often more polluted in the Front Beach due to the crowded population and tourists. However, the Front Beach is the ideal place for you to watch the scenery of twilight or have a walk. Con Dao is well-known for its crystal clear beach, the green range of coconuts and white sand. With the beauty, Con Dao attracts any tourist right from the first sight. The pristine attraction of Con Dao makes it the true tourist paradise in Vietnam. It is a pagoda which is located on the Big Mountain slope of Vung Tau City. The beauty of this pagoda is a nice blend of religious architecture and natural sceneries. The most notable is the Octagonal Tower, which is 19 meters high and the Shakyamuni Buddha Statue sitting on a lotus. They were built in the middle of the mountain so that tourists can see them from a far distance. 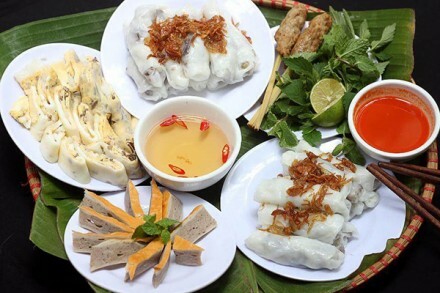 To get there in your trip to Vietnam package, visitors can go along Le Loi Street, turn to Tran Phu Street to the Front Beach before getting to Dau Beach and the Rocky Dock. From there you can see the Platform of Shakyamuni Buddha Statue. 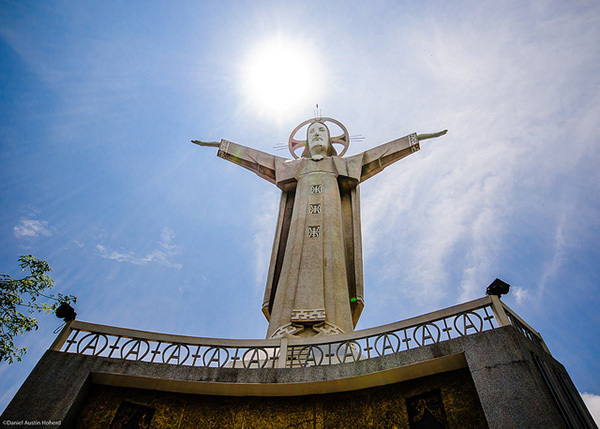 The statue is positioned on the Small Mountaintop of Vung Tau City. It was constructed in 1974. It has the height of 32 meters with the stretched arm’s length of 18.3 meters from the altitude above 170 meters looking toward the beach. Inside the statue, there is a staircase which consists of 133 steps up to the two arms of Jesus. This structure can be seen as a similar version of the famous origin in Rio de Janeiro City, Brazil. In 1898, the Indochina Governor Paul Downer built this villa with the name after her daughter, Blanche. It is located on the Phuoc Thang fortress where aimed to fire at French battleship nearly 50 years ago. Villa Blanch is a Roman construction of 3 floors, 19 meters high and leaning on the Big Mountain. Here keep 19 cannons used in the war. This is one of the interesting destinations to go and explore when visiting Vung Tau. You can experience the cable while watching the surrounding sceneries and play tremendous games for recreation as well as swim in the pool. 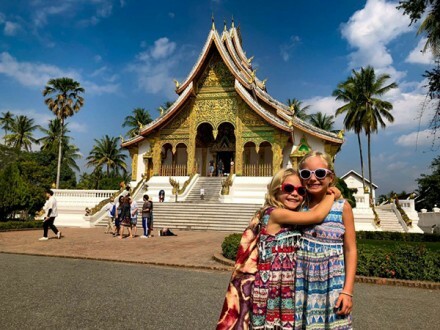 Especially, this place is an ideal destination for children with a set of games such as planes, riding horse, trains, waterpark… They will be the best reward for your kids in their holiday trip to Vietnam package. This is one of the most beautiful temples in Vung Tau with the modern architectural features. Also being called the “Lying Buddha Temple”, it was built on the Small Mountain slope toward the sea. The temple started to be constructed from 1969 and completed in 1974 by the funding money of Buddhists. 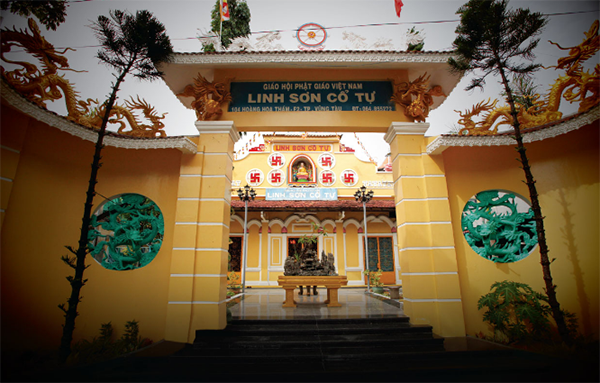 Despite the modest size, Linh Son Co Tu is the most ancient pagoda in Vung Tau. In the presbytery, there is a Buddha statue which is 1.2 meters long and made of gilded stone. It was cleverly sculptured to create the lively expression on the face of the Buddha. Getting here, after going along the tunnel which was firmly constructed in the 2-story house used to be the accommodation of the lighthouse guards, you will reach the peak of the tower. From there, you can watch the whole view of Vung Tau City in a blanket of fog. The Big House on Long Son Island is an ancient style architectural collection. It was made of tile brick and precious woods with the total area of approximately 2 hectares. It was divided into 3 parts based on their functions. 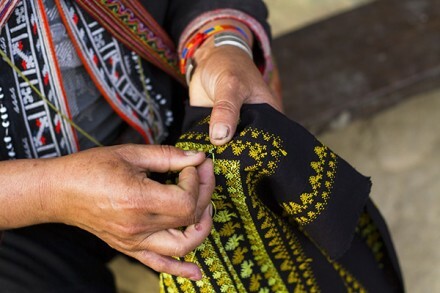 Annually, there are festivals to tribute the death day of Ong Tran, the name local people use to call Le Van Huu, the father of this architectural complex. When visitors come to the Big House in the occasions, they will be served with free meals and are provided with free accommodation as well. The design of the Upside Down House in Vung Tau is originally a 3-story building, including 2 main parts for visitors and cafes. In the sightseeing area, there are 7 shooting rooms so that tourists can save the unique experiences when going inside the interesting house. In each house, there are about 4 different corners to take photos. All rooms are decorated with suitable colors and interior design for the actual needs of tourists. Not only being attracted by the look of the outside, you will be surprised when walking into the house. All the furniture stuff is upside down. In detail, for example, you will walk on roofs instead of the floor, and all furniture is above your heads. The odd and special arrangement make tourists feel like they are lost in an astronaut station. 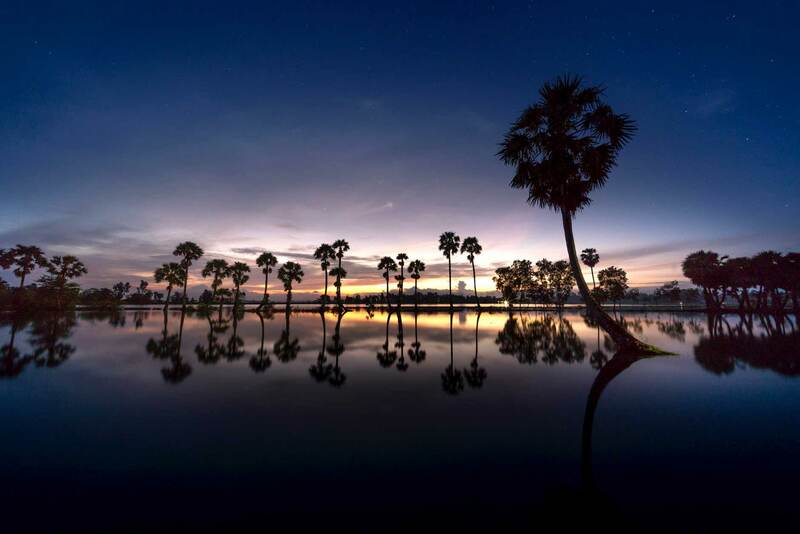 Therefore, if you have a chance to visit Vung Tau, do not forget to spend some time in this amazing house and take great photos to keep them as one of your best moments in Vung Tau. To visit this house, you only have to pay VND 40,000 per person for the ticket. You are welcomed to the house from 6 a.m. to 10 p.m. daily. Vung Tau is indeed a worthy destination in your journey in Vietnam. 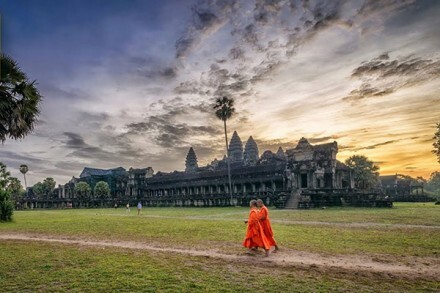 If you choose to visit this city for your holiday trip to Vietnam package, make sure that you will not be lost and waste time doing nothing. Hopefully, this article has given you the most valuable information to prepare for your own trip.